Hero of Chilean independence struggle born in 1788 in Santiago and died in the same city in 1851. He/She was twice the maximum judiciary in his country, a how Supreme dictator (1823-26) and the other as President (1827). His association with the army began in 1811 to enlist in the Dragons Squad of the border and promoted to Lieutenant in 1813. The same year participated in the battles of Talcahuano, Huilquilemu and the oak and the following year at the El Quilo. Already as captain took part in 1814 in the battle of Rancagua, and then, after the defeat of the Patriots troops took refuge in Buenos Aires. The trans-Andean nation joined the liberator of the Andes army, in which the own general José de San Martín entrusted to take the city of Talca. Fulfilling this order occupied the square February 11, 1817, days before the battle of Chacabuco. He/She also participated in the fighting of Curapalihue and Cerro Gavilan in 1818. After these military incursions took the intendancy of Concepción in 1819. However the following year he/she defeated in combat the realist Vicente Benavides. 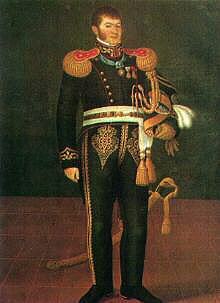 After the abdication of the general Bernardo O'Higgins took over as Supreme Head of the nation's April 4, 1823. Its main measures during this period corresponded a: substitution of the customs regulation for expansion of the regulation of free trade; the incorporation of indigenous peoples to the currency property regime; the prohibition of bury corpses in the churches, and the reorganization of the receipt of Valparaiso. It also enacted the freedom of the press and by means of a law abolished slavery the 24 July 1823. On 1 September of the same year was re-elected as Supreme director. On several occasions it delegated command to participate in the campaigns of Chiloé. He/She commanded an expedition of 3,000 men to fight the Spanish Antonio Quintanilla and expel definitely the realists of the Chiloé archipelago. Through the Treaty of Tantauco it annexed to Chile this last Iberian possession. On his return from the island he/she resigned the command, but it was ratified again as Supreme director of Chile. Between 1827 and 1829 took numerous times the direction of the country. Also between 1827 and 1828 he/she was interim Senator for Maule. He/She actively participated in the Civil War of 1829-1830 in which was defeated at the battle of Lircay. After being tried and sentenced to death, he/she managed to emigrate to Tahiti. He returned from exile in 1836 for promoting a rebellion in the islands of Chiloé, but failed and was imprisoned and sentenced to death, a sentence that was commuted him from deportation, first to the island of Juan Fernández, and then to Sydney. He/She was allowed to return to Chile in 1842. From then on lived withdrawn from all political activities until December 9, 1851, date of his death in Santiago. His work was crucial in a period of consolidation of the Republic, when fundamental political parties were configured and the big problems clashed with the Church. BIZARRO, S. Historical Dictionary of Chile. The Scarecrow Press, Inc. Metuchen, NY and London, 1987. ENCINA, F. A. Resumen of the history of Chile, Santiago de Chile, edit. Zig-Zag, 1954. SOURCES, J.; CORTES, L.; CASTLE, F.; and VALDES, A. Historical Dictionary of Chile. Santiago, edit. Zig-Zag, 1984. VILLALOBOS, S.; OSVALDO SILVA, F.; SILVA, P. E. history of Chile. Santiago, Editorial Universitaria, 1983.